Stuart Feldman of Swampscott, a Boston lawyer, says he plans to use the Lynn ferry regularly for his commute to the city. LYNN — It is not every day that the city of Lynn makes an $8 million bet. But in this case, Lynn officials are hoping that some of the 40,000 drivers who head toward Boston on the Lynnway every weekday will choose to take a new Lynn-Boston ferry that can bring them to the edge of the Financial District in about 35 minutes. The ferry, located at the newly renovated Blossom Street Extension and run by Boston Harbor Cruises, began its route on May 19 and will run three round trips each weekday to Boston’s Central Wharf — next to the New England Aquarium — until Sept. 12. The ferry leaves from Lynn at 6:30 and 8 a.m. and also makes an evening run to Boston at 6:30 p.m. It makes its Boston-to-Lynn trips at 7:15 a.m., 5:45 p.m., and 7:15 p.m. Fares for the trips are $7 one way, $14 round trip; MBTA commuters can travel for free with a Zone 2 or higher monthly T pass. While nearly all of the $8 million came from state and federal funds — the nonprofit Economic Development and Industrial Corporation of Lynn contributed $650,000 — EDIC executive director Jim Cowdell predicted the ferry would succeed because of the number of commuters who may prefer to take a quick boat ride to Boston rather than face rush-hour traffic. “It’s a regional project and it includes Lynn, Nahant, Swampscott, and Marblehead,” said Cowdell, who has worked since 2006 to bring a ferry to the formerly dilapidated 4-acre site known mostly as a cracked and weed-covered parking lot, and as a summer homeless encampment. Cowdell said he is also hoping the amenities will entice people to try the ferry run. At the newly paved lot, there are 301 free parking spaces. Aboard the boat, commuters can sip coffee, nosh on bagels, sandwiches, or wraps, and spread out their newspaper, laptop, or tablet at the roomy booths on the first-floor main cabin. With 250 seats, commuters can also roam around on the ferry, from the bow — which offers spectacular views of Revere Beach and Boston Harbor — to the upstairs cabin, which has padded seats. For the next two years, the state will cover the ferry’s operating costs and watch its passenger count to judge if the service could go year-round. The two-year, $1.3-million pilot program will be paid for by the Seaport Advisory Council — which will cover the ferry’s operating and maintenance expenses. The Lynn ferry joins Salem as the other seasonal North Shore commuter boat to Boston. Salem’s season runs until Halloween, and last year 66,617 passengers boarded the Salem ferry, which is also run by Boston Harbor Cruises. Cowdell said his goal is to have at least 350 people take the Lynn ferry each day during the two-year state-subsidized period, which would allow the boat to break even. To find the new dock and boat, commuters must first locate a white sign on the corner of the Lynnway pointing toward the ferry. This month, the Economic Development & Industrial Corporation of Lynn will sponsor radio commercials and newspaper ads about the ferry in the Greater Boston market. On a recent morning, 19 people boarded the 6:30 ferry to Boston. Several, including Swampscott attorney Stuart Feldman, were elated to leave their cars behind for a seat on the vessel and a breath of ocean air. 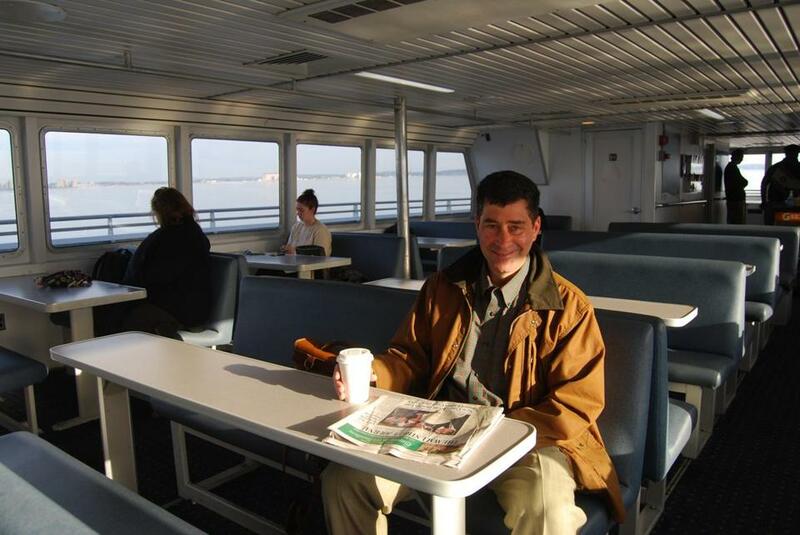 “It’s a very civilized and scenic way to travel,” said Feldman, who usually takes the commuter train to Boston but on this morning sipped coffee and was able to spread out his newspaper on a booth table. Tracey Crowell also relaxed as the ferry glided by Revere Beach and Deer Island on its way to Central Wharf. “It’s a lot nicer to be sitting on a boat and enjoying a lovely view and a nice little breeze, versus sitting in traffic and having that harried commute to Boston,” she said. State Senator Thomas M. McGee, who lobbied four governors during the last 15 years to obtain funding for a ferry, said he believes the commuter boat service will help jump-start the redevelopment of the city’s waterfront. “This is the first step to a much greater opportunity in our city,” said McGee. In recent years, high-tension power lines were removed from more than 100 acres along the city’s waterfront behind the Lynnway. The city also rezoned the property to allow for mixed-use and residential development, with towers as high as 20 stories allowed. Since the recession, though, no new construction has taken place. Lynn Mayor Judith Flanagan Kennedy said she is also optimistic the ferry could help attract investment. “We are hoping for the ferry to be a catalyst for future waterfront redevelopment,” said Flanagan-Kennedy. Back at the dock, Cowdell pointed toward an adjoining dirt parking lot that also sits on the ocean. The property, owned by the Economic Development & Industrial Corporation of Lynn, also has Designated Port Area status, which limits development to mostly marine-related use and prohibits condominiums or apartments. Cowdell said he is hoping to convince the state to put up $2.5 million to build a two-story, 20,000-square-foot year-round ferry terminal and an upscale restaurant. “I think we’ll have enough ridership that we’ll build a case that this is sustainable,” he said. Steven A. Rosenberg can be reached at srosenberg@globe. com. Follow him on Twitter @WriteRosenberg.